Chichester's Pallant House Gallery has a new exhibition looking at how, in the late 1930s, British artists reacted to the Spanish Civil War and the great crisis in European politics in the period before World War Two. The artists mostly supported the Republican side, which had been ejected from power by General Franco. Most of the artists are dead - but painter Ursula McCannell can recall the Spain she encountered as a teenager in 1936. Simon Martin has curated the exhibition Conscience and Conflict: British Artists and the Spanish Civil War. "It puzzles me that no-one has done the show before," says Martin. "It's fairly easy to discover how writers like George Orwell or WH Auden or Laurie Lee reacted to the Spanish crisis. But what Britain's painters and sculptors did is less well known." Given that the civil war ended in 1939, it's remarkable that the Pallant House Gallery in Chichester has pictures on the walls by a living artist, painted just after she returned from a country in the early stages of war. McCannell was 13 at the time. Today, at 91, she still paints at her home in Surrey. Her father was Otway McCannell, a painter and teacher. As with many intellectual British families in the 1930s there was much discussion at home of the growing crisis in Madrid. She remembers her father worrying about the pressure the Republican government was under from the Nationalists under General Franco. Later in the war he would plot the two sides' changing fortunes on a big map of Spain, despairing as the Republicans lost control. "Every Thursday we had Left Book Club meetings at our house and there would be people talking about Spain and politics. In truth, when we went to Torremolinos in 1936, it was partly to stay with a school friend. But I remember the suffering of the local people clearly. The sense of unease was obvious, even to a young person like me." One of McCannell's paintings on show is Family of Beggars. "I didn't paint or sketch in Torremolinos, which in those days was just a sleepy little village and totally unlike how it is now. I started the paintings when we got back to England. There were quite a lot of them but I sold some. "In fact the beggars were outside the cathedral at Malaga. They were a pathetic sight but my parents thought I ought to see everything. "When we got back I was interviewed by newspapers including the Daily Mail. They were fascinated that a 13-year-old had painted pictures of the Spanish poor. I wasn't painting the conflict as such, but they said I'd portrayed the suffering of refugees well. You couldn't help being moved." McCannell is among the last artistic witnesses to the crisis of Spanish politics in the 1930s. Martin has selected around 100 other works to give an overview of how British art responded. "Artists had seen the rise of Fascism in Germany but there was no political debate in Germany: the Nazis had simply crushed the opposition. "Spain was different and at first it seemed the elected Republican government might be able to fight back. So British artists felt it worthwhile to take sides. Though it's true that only a few of the painters went to Spain once the conflict was underway: the poets did a bit better in that regard. "But the very first British volunteer to die in Spain was an artist: Felicia Browne. She was killed during fighting in August 1936 and became a heroine for many in British art. "In fact it became very difficult for artists and others to get to Spain: they would be denied visas. Well-known names such as Henry Moore and Jacob Epstein tried to go but couldn't. It's hard to think of artists today seeking to enter a dangerous war-zone: it's something we associate more with photo-journalism. "People often assume all artists were anti-Franco and indeed modernist artists usually were. But there were exceptions: the artist Wyndham Lewis was more sympathetic to the Nationalists, as we make clear. 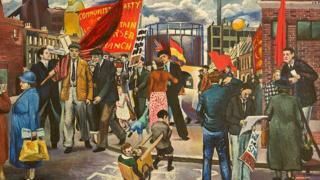 Martin says one of the most interesting paintings is Clive Branson's Demonstration in Battersea. "Branson came from a fairly well-off background and in the 1930s became a Communist. He was one of the few British artists who actually did fight in Spain with the International Brigade. When he was taken prisoner he did some quite well-known pictures of the camp he was in. "But the Battersea picture has a real flavour of London politics in the 1930s. The painting features the Union Jack, a Spanish flag and a red Communist banner. And someone is reading the Daily Worker, which was the Communist newspaper of the time. It's a record of a moment in political history." The Pallant House exhibition is essentially about the work of British artists responding to events in Spain. But Martin has made an exception for Picasso's well-known painting Weeping Woman, which belongs to the Tate. "It's a picture of Picasso's lover Dora Marr, painted in 1937. But I felt we needed to at least hint at how important Picasso was at that time for British artists. "In 1938 Picasso's great classic Guernica was brought to England by the artist Roland Penrose. It shows the German bombing of the Basque town of Guernica, done at Franco's request: it became a rallying point for those who detested Franco and the Fascists. "Of course it would have been lovely to bring the original from Madrid but that might be a little impractical: so Weeping Woman can take its place." One of the most chilling pictures is Premonition, by German artist Walter Nessler. It seems to ask, as early as 1937, what would happen if the Germans ever bombed London. Other artists in the exhibition include Henry Moore, Edward Burra and E McKnight Kauffer, best known for his poster work. Martin says it's fascinating how many of them draw on the imagery of Spain's Old Masters. "Look around the walls and you'll see an influence of Velazquez here and there. And certainly Ursula McCannell was aware of the work of El Greco - which for a teenager was pretty remarkable." He says he'll be delighted if his show makes visitors more aware of the political engagement of the artists of the 1930s. "Someone like Henry Moore now seems an establishment figure but this show will remind people that these artists were once young and politically engaged. It was a time when culture and politics intersected - it's a rich and fascinating moment in art." Conscience and Conflict: British Artists and the Spanish Civil War runs until 15 February 2015 at Pallant House, Chichester.